Syllabus, course material, homeworks, photos, etc from an Introduction to Microcontrollers with AVR chips class can be found here. Covers: What the AVRs are, what all the pins do, what they can do for you. A brief tour of the toolchain, and getting your firmware up and running on the chip. Reading the datasheets. 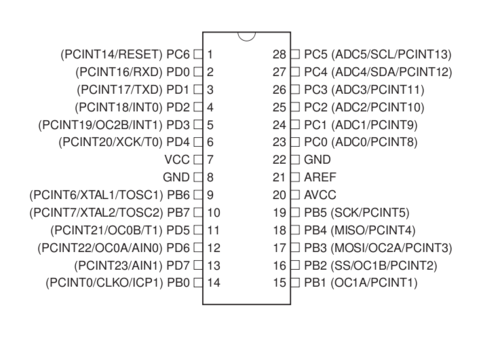 How to make chips speak digital to the outside world, pin-by-pin. Just enough C programming fundamentals to make it work. Lab: Building the kit and running a test LED flasher. For assembly instructions and more details on the class kit, see Avr2011_kit. How to program the class kit, see Avr2011 Programming The Kit. Homework: More soldering, and Cylon Eyes. Optional extra credit: Simple POV toy (hint, make the timing around 2ms between updates and swing your arms). Super bonus points: Make a neat POV toy. Interfacing with the real world is the soul of microcontrolling. Covers: Gathering simple data from the world, and learn how to spit it back out. A serial link with your computer enables all sorts of tricks, and enables the microcontroller version of printf debugging. Some boolean logic comes in handy here. Along the way, we'll learn a bunch about debouncing switches. OPC (Other People's Code): microTweeter a silly little program to interface twitter with a microcontroller. It is designed to post quotes from a file when a button is pressed on a microcontroller. This was done as learning experience with python, serial communications and social media integration. -Will G.
Covers: Learn about ways to fake analog data into and out of your microcontroller. We'll learn how to switch logic states fast to emulate an analog output, and how to use the built-in analog-to-digital converters to measure the complex real-world. Covers: Interrupts call subroutines when certain conditions are true. They take a lot of the programming burden off your shoulders, enable the AVR to syncronize to external devices, and are great for super-fast response applications. Covers: Timers and counters let you time and count events! Up until now, we've been doing a lot with for loops and delays to count the passing of time. It's much easier and more precise to let the hardware do the timing. When you add interrupts and timers together, the world becomes your oyster! Covers: First, we'll cover using the internal flash memory and EEPROM for data storage. Then I'll demo how to use other people's code/libraries and tie it in to our packages, interfacing with all sorts of random devices for fun and profit. The final (optional) trick will be turning your classboard into a standalone AVR programmer so that you can program raw chips yourself, and outgrow the bootloader. This page was last modified on 3 April 2012, at 13:49.